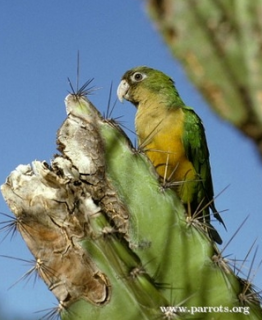 With Cactus Conures, as well as many other parrot species, both the male and female incubate their eggs. E.c. cactorum: Both adults in general yellow/green; pale brown crown; brown face and upper breast; orange/yellow lower breast and abdomen; green tail tipped with blue. Bill horn coloured. Eye ring bare and white. Eye orange. E.c. caixana: Both adults as in cactorum, but paler green body colour; buff/brown throat and breast; abdomen in centre less orange and more yellow. Green crown, brown tinge minimal or absent; olive breast and abdomen, with orange tips to some feathers. Eye brown. Calls made in flight are strident notes, repeated in short bursts between pauses. Softer notes when feeding. Fruit such as: apple, pear, banana, orange, cactus fruits, pomegranate, forming about 30 percent of the diet; vegetables such as: carrots, celery, green beans and peas in the pod; green leaves such as: Swiss chard, lettuce, sowthistle, dandelion, chickweed; spray millet; small seed mix such as: canary, millet, and smaller amounts of oats, buckwheat and a little hemp; soaked and sprouted sunflower seed; cooked beans and pulses, boiled maize, and complete pellet. Enjoys bathing, so provide overhead misters or shallow bowls of water. Is also a vigorous chewer, so provide bird-safe, unsprayed branches of flowering trees, fir, pine and willow, heat sterilized pine cones, wooden toys, vegetable tanned leather toys, ladders, swings and noise-makers. Vertical box 8" x 8" x 14" (20.3cm x 20.3cm x 35.5cm). Local persecution due to crop raiding. This species is also trapped for the pet bird trade. Long term threat from excessive degradation of habitat and habitat loss. E.c. cactorum: Confined to Bahia, south of Rio Sao Francisco, and nearby NE Minas Gerais. E.c. caixana: West and north of Rio Sao Francisco, in NW Bahia and W Pernambuco north to Ceara, Piaui and SE Maranhao. Found up to 600m (1968 ft) in caatinga scrubland dominated by low thorny shrubs and small trees; also found in open semidesert country including overgrazed pastures. Feeds on seeds, fruits, cactus, berries, nuts, flowers and buds, and sometimes crops. Seen in pairs or flocks of up to 20 individuals outside of breeding season. More gather together in groups where food is abundant.